When Margaret Conover asked the Sustainability Studies Program if we could quantify use-patterns in the Ashley Schiff Park Preserve, two Environment and Human Impact students enthusiastically said yes! Photo 1. 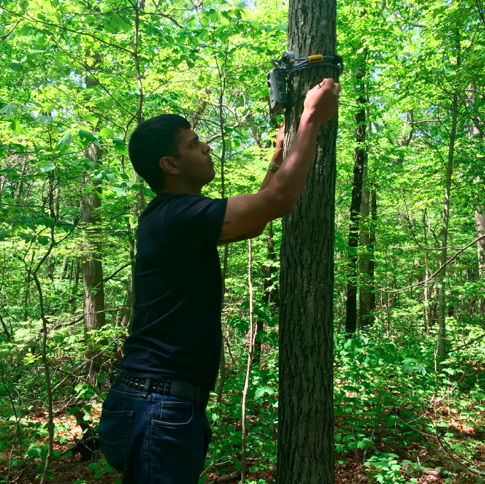 Student Andrew Fiorenza hangs a camera trap in the Ashley Schiff Park Preserve. He received funding from the Friends of Ashley Schiff to conduct this project. 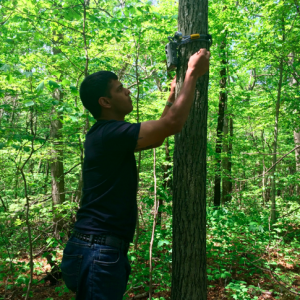 With the help of Dr. Sharon Pochron, students Alexandra VanLoo and Andrew Fiorenza wrote a proposal to hang camera traps and count the number of heads that had shown up in the photos. They want to collect data for a full year to get an idea of how people use the park during all seasons. With excitement, the Friends of Ashley Schiff Park Preserve approved of their proposal, providing the funds necessary to complete this study . Alex and Andrew have already purchased the cameras and hung them at the trailheads. Despite abundant amounts of rain, they have managed to get the perfect angles for the cameras to snap photos just as people pass the park entrance. In addition to the technical work, they have read multiple sources of prior studies regarding methods that other parks have used to assess human-use patterns. Working in conjuction with Dr. Pochron, they plan to quantify park use with the addition of displaying how use changes with season. They plan to present their results at next spring’s URECA. Photo 2. Photographic data from camera trap. The cameras take pictures of people as they pass into the park. 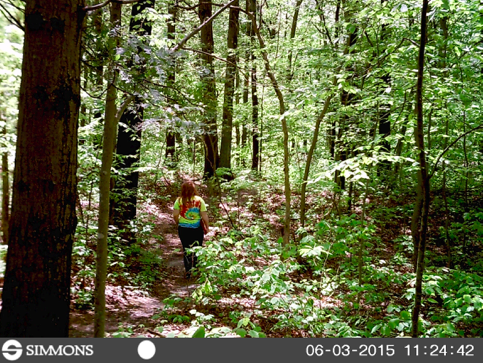 This camera-trap photo shows Alex VanLoo, who received funding from the Friends of Ashley Schiff, entering the park. The scholarships for Alexandra VanLoo and Andrew Fiorenza will be awarded at Friends of Ashley Schiff Park Preserve annual Membership Reception from 5:30 to 7:30pm, Thursday, September 24 at the Simons Center. Carl Safina is the invited guest speaker. If you would like to attend this reception, you must join the membership for the Friends of Ashley Schiff Park Preserve. Membership is free and open to all, so don’t hesitate to sign up today! Click here to R.S.V.P. for the reception. See you there! This entry was posted in Uncategorized and tagged Students by jeanettelee. Bookmark the permalink. The data may be interesting to map geospatially; perhaps a student in GSS 313/314 could map it eventually!